So after tibial plateau surgery and physiotherapy, after pain and gym sessions, after exercise bikes and endless walks, the day will come when you have to go back to the surgeon to see if the operation he performed was successful. After all the work and the sleepless nights you will find out if it has been worthwhile. This will come for most patients about 10 months after surgery. It did for me. 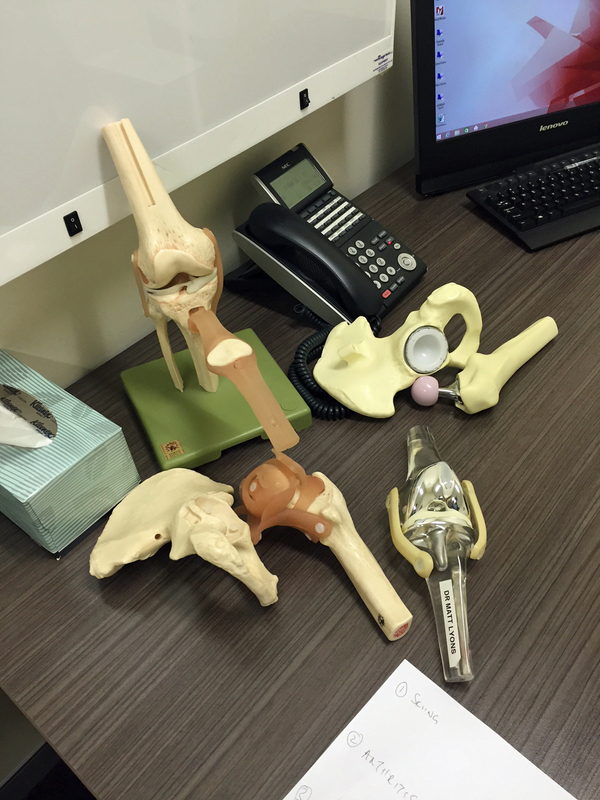 The cluttered paraphernalia on an orthopaedic surgeon’s desk. My list of questions is also in the photograph. At 10am I was shown into Dr Matt Lyons (now familiar) office at the Mater Hospital. Lot of water under the bridge since I sat in this same room in February after arriving back from Canada with a broken leg. Now, tightly clutched in my hand was a list of questions I had composed that I hoped he would answer. It was quiet in the room where I sat alone, inspecting the stuff on his desk. Surgeons have really neat stuff on their desks. He arrived after a time, same cheerful smile and R M Williams riding boots. I never thought about the whimsy of being cut open by someone wearing footwear designed for breaking horses. But hey, life is strange, right? He did the expected examination and said my leg had made “an amazing recovery.” I have only a minimal amount of lateral movement in the broken knee. This is known as “laxity.” It can be from grade 1, which is very little sideways movement to grade 5, which is lots of sideways movement. If you had much more than about 3 you would have such a wobbly knee that I suspect it would be very difficult to go skiing. He pushed my thigh one way while pulling my shin the other, pushing back and forth. Even I could tell that there wasn’t much movement. I have grade 1 laxity. “You’ve done really well, There is a lot of muscle development around your knee,” he said. QUESTIONS TO ASK YOUR SURGEON: Anyone who is consulting a surgeon, for the final time, after a significant procedure, should take along a written list of questions. Why? If you don’t take along a list of questions you are likely to forget to ask something important. Surgery and rehabilitation are very complex matters for the layman, involving arcane medical terminology, replete with complex Greek and Latin words. It is easy to get lost in the jargon. Also, if you take a written list you can write down the answers as the surgeon talks. This helps later. Sometimes, I can remember asking the questions but I can’t remember the answers and it is easy to get confused. Some, not all, surgeons are prone to talking down to their patients, which makes it really difficult. 1. Can I resume skiing? 2. Am I likely to get arthritis in the injured knee? 3. Will my leg make a complete recovery? 4. Should I have the plate out? If not what are the risks? 5. Have I damaged the meniscus? 6. Should I keep going with the exercises? 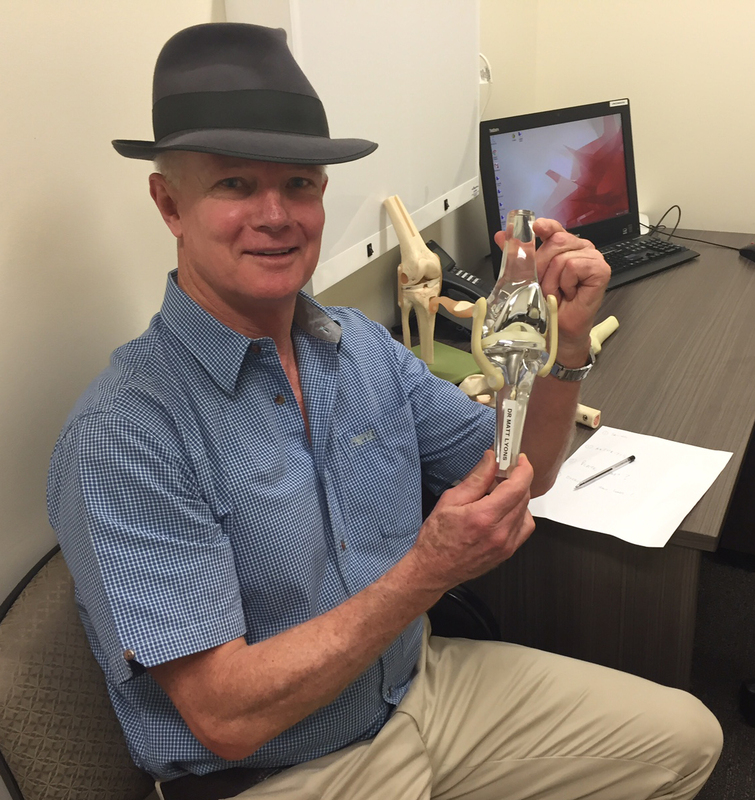 You may have a different list of questions after a tibial plateau fracture and surgery. That’s okay they will be your questions based around your particular experience. But you should have some questions. There is really neat stuff to play with on a surgeon’s desk when they are not there, like this model of the human knee. Such fun and your health care fund pays for it all. CAN I RESUME SKIING: “Yes, the leg is strong enough to go skiing.” I inquired whether it will hurt the first time and whether it will hurt when I have to twist out of bindings in a fall. “Probably,” he replied. “The only way you will find out is to go and give it a try. It will be trial and error in the beginning” That’s pretty good news. Montana, here I come. WILL I BE MORE PRONE TO ARTHRITIS IN THE INJURED LEG? “Yes you will be more prone to arthritis in your broken leg. It was a significant injury with surgical intervention. However, when that presents itself is anyone’s guess. You can delay the impact by keeping your quad strong, keeping your weight down and only doing low impact exercises, so as not to stress the knee joint too much. No running from here on.” All of this was fine with me. SHOULD I HAVE THE PLATE OUT? IF NOT WHAT ARE THE RISKS? Depends if it is bothering you. I wouldn’t make a decision on that before about 18 months to 2 years. The major risk of leaving the plate in there is that if you have another traumatic accident while skiing you can get significant fractures around the plate.” When I said it’s not bothering me, I don’t even notice it, he suggested we just leave it alone, at least for the time being. I thought this was an interesting view and one I will have to discuss with Belinda. “She who must be obeyed,” at the Virgin gym will have a view on this no doubt. 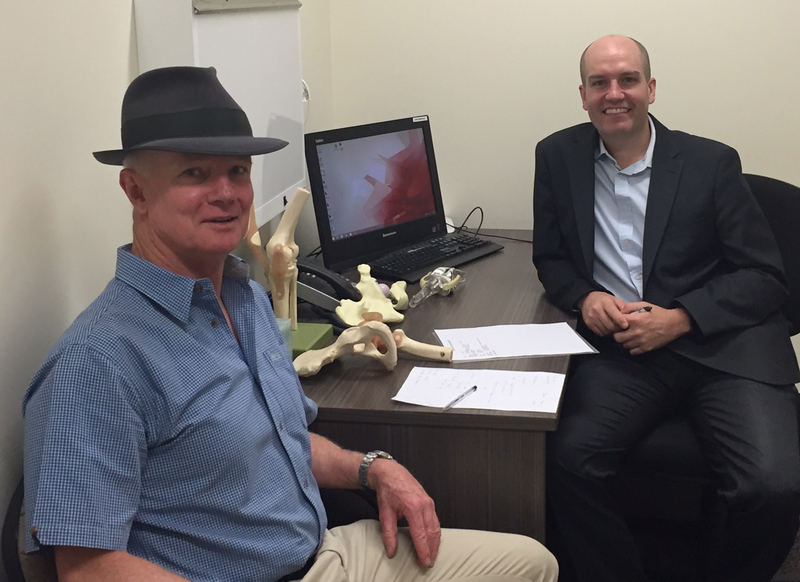 Going through my questions with Dr Matt Lyons in his rooms at the Mater clinic in Sydney. He was very patient, not only answering my letter in detail, but also my page of questions at our final meeting.